Eva Solo's large glass carafe holds 1.4 litres and is perfect for serving water at meetings or wine and other drinks at social get-togethers. The drip-free carafe is a carefully designed product for serving drinks, and it has won several international design prizes. 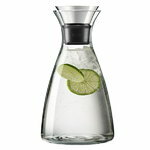 The carafe comes with pouring lip made of stainless steel and silicone rubber. The entire carafe is dishwasher-proof. The steel lid for the carafe is sold separately. Tools Design is a Danish design studio founded in 1989 by Claus Jensen and Henrik Holbæk. Claus Jensen (b. 1966) is an industrial designer who has graduated from the Danish Design School, Copenhagen, and Henrik Holbæk (b. 1960) is an industrial designer and architect who has graduated from the Royal Academy of Arts, Department of Industrial Design, Copenhagen. The products of Tools Design are often characterized by a simplistic and innovative approach. Their products’ range goes from electronics and medical equipment to household products. The design philosophy of Tools Design is to put “something extra” into the products. The strength of the studio is to manage product design and communication to create lifestyle design. Tools Design has designed the entire Eva Solo’s product range – a wide range of items that go from kitchen accessories and utensils to outdoor products and bathroom accessories, all characterized by an innovative design. With more than 200 awards and distinctions, Tools Design rank amongst Denmark’s most awarded designers.